The Wells Fargo Business Platinum currently has an Informr score of 7.8 out of 10. This score is based on our evaluation of 2 sources including reviews from users and the web's most trusted critics. 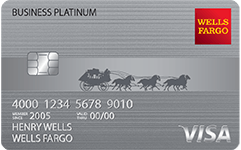 Wells Fargo Business Platinum is typically available to those with excellent credit scores (650 or greater). The Wells Fargo Business Platinum card offers business owners a reasonable interest rate and the unusual option of choosing between points or cash back rewards, with a high rewards rate on cash back. Business owners who like Wells Fargo will enjoy the Wells Fargo Business Platinum credit card’s straightforward cash rewards rate and lack of an annual fee and foreign transaction fee. -On purchases within the first 3 months. - Or 50,000 bonus points after spending $3,000 on purchases within the first 3 months. - Receive 1,000 bonus points when your company spend reaches $1,000 in any monthly billing period.